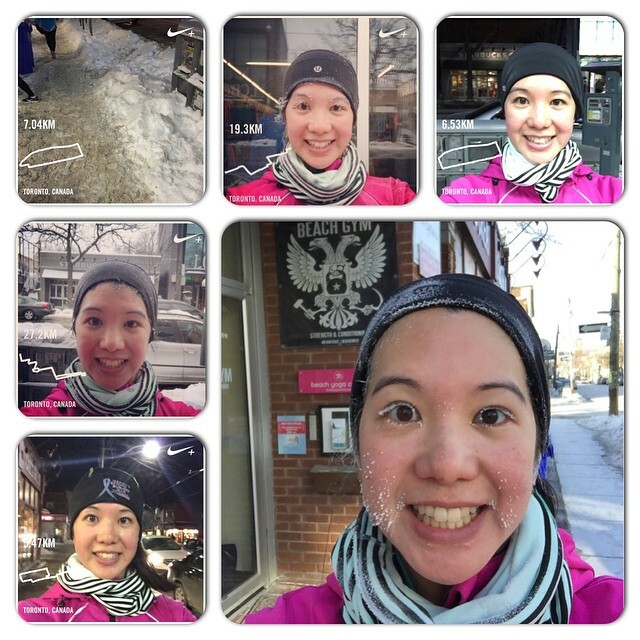 This was one of the coldest Februarys on record and I’m proud to say that I ran through it. Not only did I run through it, but I was crazy enough to run outside every single time. This is the first winter that I’ve trained consistently and I’m hoping that it will pay off in my next set of spring races. So long February! Some select February selfies. It was cold and miserable but I survived thanks to my running group. Running with a group has kept me accountable and on track to reaching my running goals. Trust me, without this group I never would have been running hills in -18 C (plus windchill) weather or running in -26C (feels like -40C). Whenever people hear about running during the winter season they always ask me what I wear. How you dress can make or break your winter outdoor running goals. I think that one of the reasons why I was able to keep it up was by dressing appropriately. This is my third attempt at running through the winter and I think I’ve finally figured it out (though I have to admit that it sometimes feels like it takes me 30 minutes to get dressed for a run due to all of the layers I wear. When is it spring again?). Wearing my winter running clothes as I wait to go out for hill training. I think it was -18C that night. The next layer is a midweight insulating layer. This layer is meant to help keep you warm by trapping heat and continuing to wick moisture away. I’ve heard that microfleece or polyester fleece is good for this layer. I typically wear my Nike Element Thermal Running hoodie or my Nike Dri-fit Wool Running Hoodie. When it’s warmer than -10 I typically don’t wear the insulating layer on top. For my bottoms, since my running tights aren’t winter specific running tights I usually add another insulating/outer layer. I alternate between my Nike Element Thermal Pants and my Lululemon Feelin Frosty pants. I find that these two pairs of pants help trap in heat (I can feel the heat escaping when I take them off after a run) while protecting my legs from the snow and wind. They’ve kept me warm and dry all season and are my go-to. Finally I top it all off with a running jacket. This layer helps protect against wind and weather (snow, sleet, rain etc.) while helping to trap heat in so that you don’t freeze. I always wear my Running Room Extreme jacket when it’s this cold (you can find a newer version of it here). This jacket was a good investment and even has a built in balaclava in the hood for those extra cold runs when you need something else to cover your face. I’ve also started to wear my fuel belt on longer runs under this layer. I find that it helps keep my water and eLoad and Gatorade from freezing. 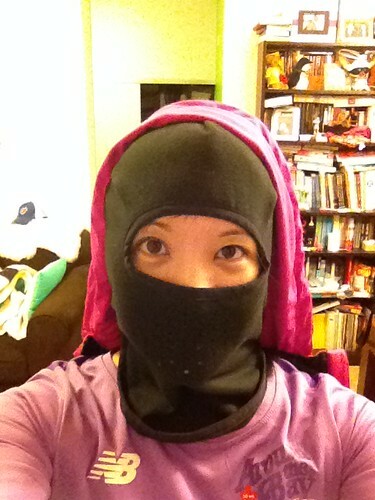 Wearing the balaclava that’s built into the hood of my running jacket. 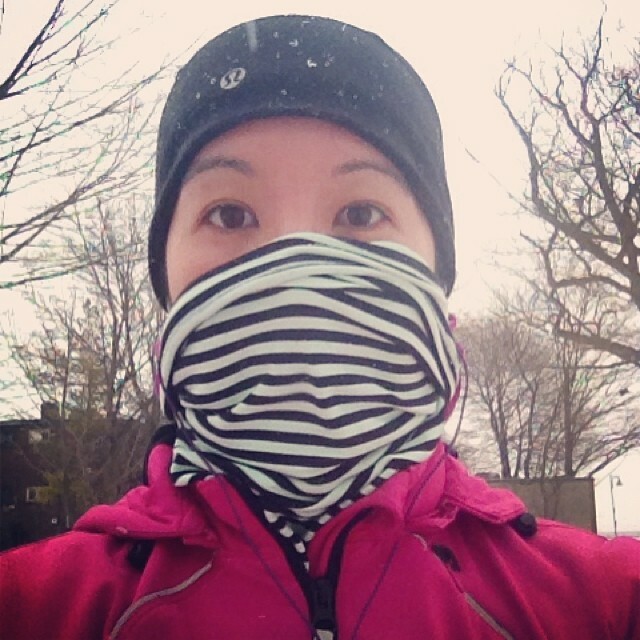 When I run with my face covered I like to pretend that I’m a ninja! Not only do you have to keep your body warm but you also need to keep your hands, feet and head warm. I usually wear my Lululemon Brisk Run neck warmer (unfortunately they don’t sell it anymore). I like this as an option because it hangs loose around my neck and I have the option to pull it up and cover my face. I usually opt for this instead of the balaclava so that I have the flexibility to pull it up and push it back down depending on how I’m feeling. You also have the ability to pull it up over your head, but I’ve never tried it before. Wearing my Lululemon Brisk Run Neck Warmer last winter. It’s a staple in my winter running gear. I always run with a hat, though this may have something to do with my fear of birds. For winter runs I cycle through three different hats: my Lululemon Brisk Run toques (I think I have two versions of it. They both cover and keep my head warm and have a nice spot for my ponytail to come out of. I don’t think they sell it anymore) and my Harry’s Spring Run Off hat. I also have a Running Room toque that I got in a race kit but haven’t really worn it. While I don’t always wear gloves or mittens I always make sure that I have them in my pockets just in case. If it’s cold enough for gloves I wear a pair of Running Room gloves that I got in a race kit (I think they’re similar to these ones). If it’s super cold then I opt for my Lululemon Brisk Run Mittens (not sure if they sell them anymore). I find that the mittens keep my hands warmer in severely cold weather. Some people wear trail running shoes etc. for winter running but I just wear my regular running shoes. I’ve heard that you can buy gators to wear over your socks and in your shoes to keep your feet warm and dry. There’s the version that goes over your entire foot and there’s also a version just for your toes. Fortunately I’ve never had to try either of them. Something that has made a difference for me this year has been my choice of socks. I’ve been running in PhD Smartwool Running Socks (similar to these) and my feet are hardly ever cold. Finally, in extreme conditions where the roads are icy or full of snow (sometimes I wonder if people own shovels at all) I have had to wear traction aids to help keep me from slipping and falling. My Yaktrax Run have helped keep my feet on the ground for the last two winters and made me feel more secure about putting one foot after the other in less than ideal conditions. When it’s really cold it drains the battery in my phone and it dies. This usually wouldn’t be a problem except I listen to music when I run (if you ran 27k outside in the cold you’d want a little distraction too!). I also use the Nike Running app, which has helped keep me motivated in running in the past three years. A former co-worker gave me this tip on how to keep my iPhone from dying. I bought an inexpensive Windriver portable hand warmer, which I turn on and carry in my pocket with my iPhone. I’ve found that this has helped keep my iPhone warm and my battery hasn’t died on the run since. I know. A hand warmer for my iPhone? It may sound ridiculous but it works. My winter running clothes strategy also carries over to other outdoor winter activities. 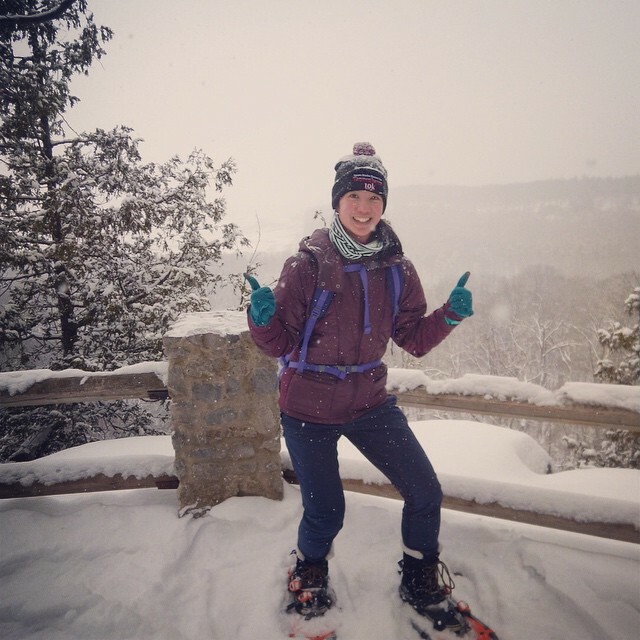 Here I am on a recent snowshoeing hike. I’m wearing all running clothes plus a warmer jacket and my Tannenbaum 10k hat, which I don’t run in. I felt very comfortable on the entire hike. Hopefully now that February is over I won’t have to dress this way much longer. Fingers are crossed that we’ll be able to shed a layer or two in the coming weeks! Woah! Super icicles on your lashes there! I discovered my limit for tolerating the cold that day. Any colder and I’m staying inside next time!